63 MKs vote in favor of Draft Law, 39 MKs vote against. 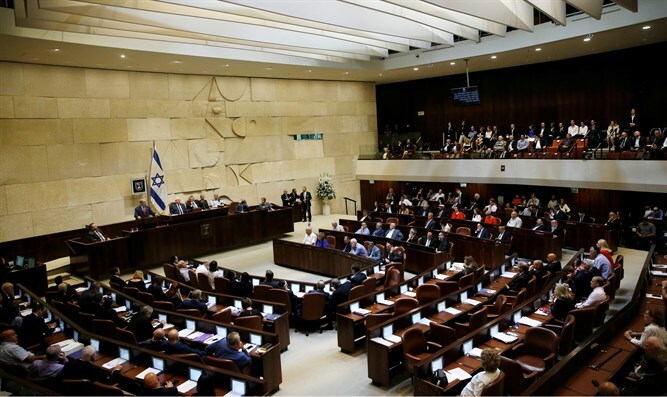 The Knesset plenum approved the first reading of the Draft Law on Monday night. 63 MKs voted in favor of the legislation and 39 MKs voted against it. The coalition voted for the bill, as did the members of the opposition Yesh Atid party. The haredi United Torah Judaism and Shas voted against. The members of the Joint List were not present at the plenum during the vote. The law determines recruitment targets for haredim, which grow in number every year, and imposes economic sanctions on yeshivas that do not meet these recruitment targets. Another clause states that the law will be repealed if the haredim fail to meet the recruitment targets for three consecutive years. Defense Minister and Yisrael Beytenu chairman Avigdor Liberman welcomed the approval of the bill. "The Knesset showed responsibility and approved the draft law in its first reading. Four months ago we torpedoed a bad law that made a mockery of the sharing of the burden. Tonight, most of the Knesset stood behind the law of the defense establishment. I hope that the law will be approved, in its currents language, in its second and third readings during this Knesset session," Liberman tweeted. Deputy Health Minister MK Yaakov Litzman (United Torah Judaism) said, "We opposed the new Draft Law as instructed by the Council of Torah Sages. Throughout the generations, the people of Israel have given their lives for the sake of learning Torah and have considered it the most important value for the future of the Jewish people. We will not agree to restrict Torah scholars and we will not support the imposition of sanctions on yeshiva students for whom Torah is their profession." Earlier on Monday, before the vote on the law, Litzman threatened that United Torah Judaism would leave the coalition. "We will not be able to agree to any law that will restrict Torah scholars in any way, and if this law, as it is, passes through three readings, we will leave the coalition," Litzman said.